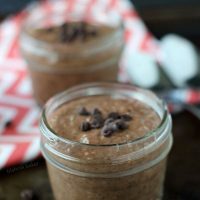 This homemade dark chocolate coconut pudding recipe is a simple, decadent and indulgent dessert that is creamy, delicious and begging for you to try it. Can I just say one LAST time that it needs to be Spring already? I know I know we are all sick of hearing about the weather and I promise this is the last time we will have this discussion (…?) But guys it is still freaking not here. We are still in the 30s and low 40s so we are almost there. All I want to do is wear the cute teal flats that I bought way back in October. They have been staring at me for months. I have at least three mental outfits planned for them but they all involve skirts, sleeveless tops, and Spring. Aieeee, my agony. I shall drown it in chocolate. Rich dark chocolate coconut pudding to be specific. By the way, thanks for letting me vent that out. But I’ll get to talking about this beauty before us. Homemade pudding has been on my to-do list for a while now and there’s nothing like a rainy cloudy day to inspire me to finally make it happen. 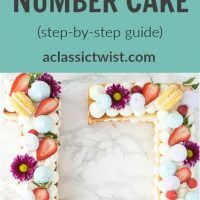 It is very easy to make if you have not tried it before and it is SO much better than the store-bought kind. It’s one decadent dessert!! 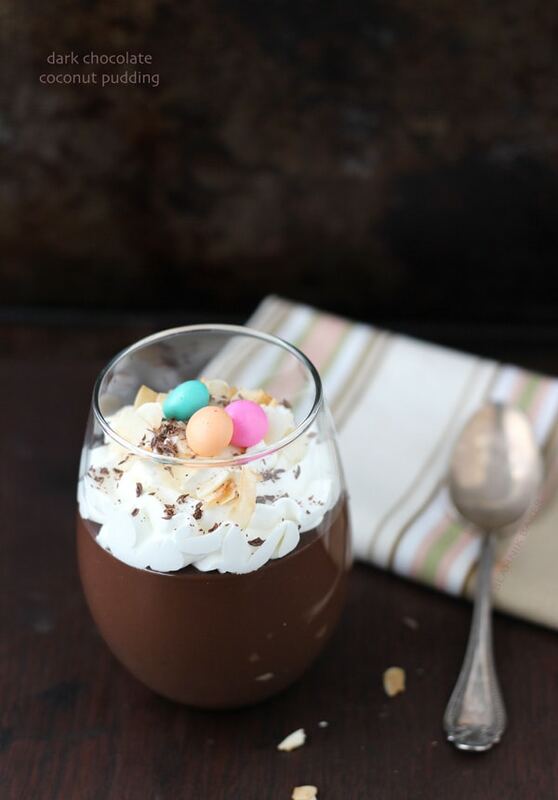 This pudding is made with 70% dark chocolate and is infused with creamy coconut milk. It results in a uber silky, rich chocolate pudding that is a simple indulgent treat and will have you satisfied after a few scoops. Trust me. It was so rich the hubster said it’s too ‘chocolatey’ and couldn’t finish his serving. 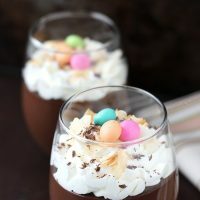 I topped with coconut whipped cream, toasted coconut flakes and chocolate shavings along with some Easter candies since Easter is just around the corner. 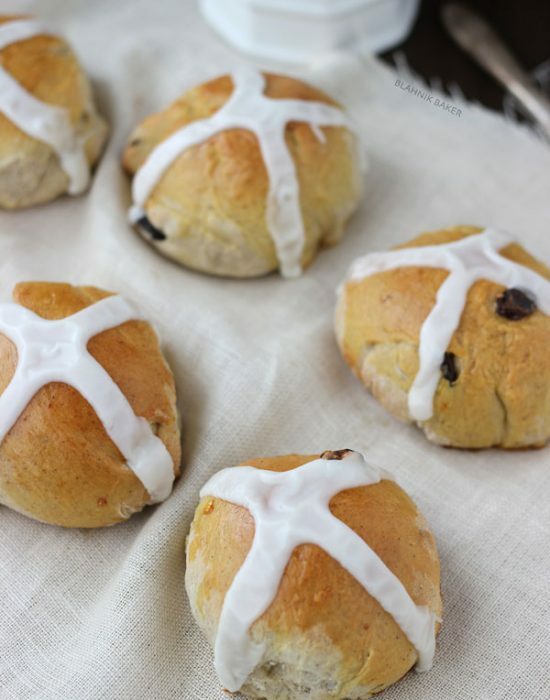 These will be perfect for your Easter brunch or dinner dessert table. In a medium saucepan, whisk together sugar, cornstarch, cocoa powder and salt. 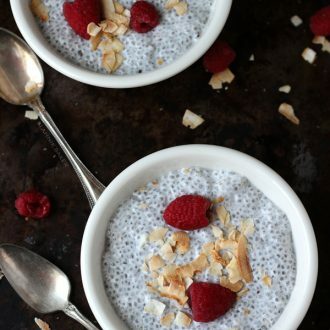 In a small bowl, whisk the egg yolks, whole milk, coconut milk, heavy cream and scrapings of vanilla seeds from bean. Add pod. Gradually whisk in the milk mixture to the dry ingredients in the saucepan until smooth. Bring mixture to boil over medium-high heat, whisking constantly. Reduce speed to medium and cook until mixture is thick enough to coat a spoon, about 4 minutes whisking constantly. Remove from heat and whisk in the melted chocolate, butter and extracts until butter is melted and mixture thickens. Strain pudding through a fine mesh sieve into a large bowl. Divide pudding into small ramekins, jars or bowls. Press plastic wrap directly onto the surface of the pudding and chill for at least 4 hours or overnight. When ready to serve, top pudding with whipped cream, coconut flakes and chocolate shavings. I can never say no to chocolate pudding! This looks so silky and delicious! It’s so hard to resist. I love homemade pudding. My mom used to call it cornstarch pudding and we would usually eat half of it warm. 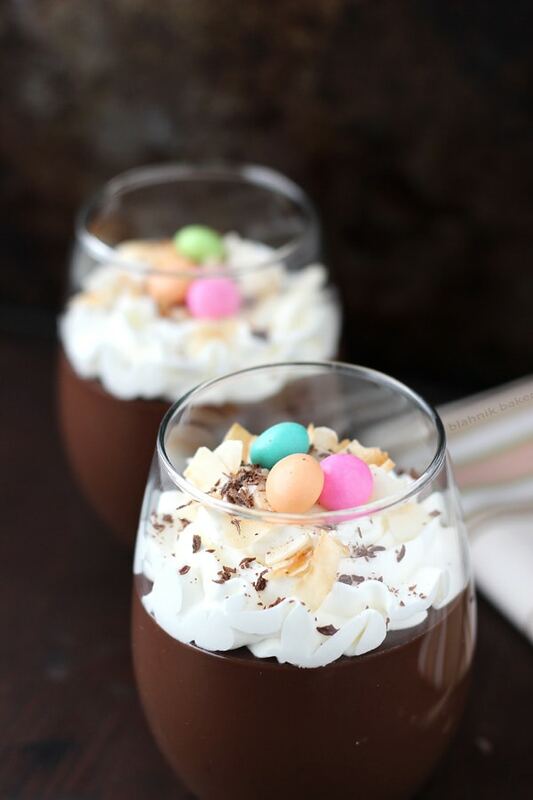 The pastel Easter eggs really stand out against that dark chocolate pudding. Beautiful! SO PRETTY!! I love pudding in any shape or form! The Easter candies on top are just adorable! Spring is taking her time… ugh! I am with you, it needs to be spring ASAP! Wish I had some of this pudding to make me feel better about this never-ending winter! Like right now kind of ASAP!!! 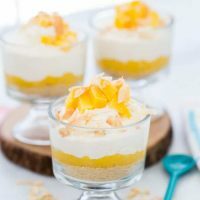 I love making pudding at home (so easy and better than store-bought), but your coconut addition took this one over the top! 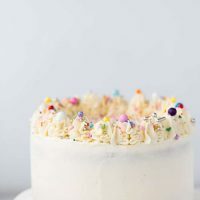 What a wonderful flavor in this Easter-inspired treat! This is seriously insanely gorgeous! The photography on this post is making my head hurt from the beauty. Gosh I love the moody background. Moody might be your best friend! Still in the 30’s?! I feel for you, Zainab. I’ll try and blow some of this 79F weather up your way! In the meantime, you’ve got me so jealous of this pudding. It looks so rich and delicious. Love that you topped it with coconut whipped cream! Haha how could it be too rich?? Mmm looks so tasty, love the coconut in it 😉 chocolate and coconut go so well together. Lol I know right? He was confused for sure!! Oh Lordy! Those wouldn’t last a minute with me. My weakness is chocolate pudding!! This looks so darn good…surely this will help us cope with these crazy weather arrangements. Seriously needs to be spring already so I can start wearing tshirts and eat this pudding! I hear ya girl!! Spring just needs to get here and stay. I’m ready for cute spring and summer clothes and bright colors. This pudding…holy cow! So rich and dark and decadent. I need it!!! I won’t even let you know what our temp has been like but I will say “man this sunburn is killing me.” Haha SO sorry, I had to make a joke! This pudding, this pudding! This is like the mother of all desserts! It really does need to be Spring for you!! I could eat ALL of this pudding by myself – dark chocolate is my favourite type of chocolate, so this dessert is pretty much made for me. I’m speechless Zainab -Your pudding looks FABULOUS !! You should come over here. We didn’t even have winter this year…. There is nothing like homemade chocolate pudding and your coconut take on it – divine!! Now – those teal flats are suffering from a case of neglect so winter better scramble out of here or your flats might be very unhappy! 1. omg don’t get me started on how much I want it to be waaaarm!!! 2. THIS PUDDING!!! I love how decadent and rich and intensely chocolatey it is! And the coconut was totally the perfect pairing. Love love loviiiiing! Zainab, pudding is always good but this sounds over the top and your photos are wonderful! Pinning and thanks for sharing! Love these photos, Zainab! Isn’t it annoying when you’ve slaved over something and hubby says something like that? Mine declares many things as ‘too rich’ and I ‘have to’ eat it all myself! It’s a hard life! Anyway, I think the pudding sounds wonderful … love the Easter thing going on there on top! I saw these on instagram and fell in love. Your chocolate pudding looks really smooth and delicious! I like home made puddings, real things are always the best. “too” chocolatey?!? I’m not entirely sure what that means. But it is odd. This pudding looks just chocolatey enough for me!! Good enough to lick the cup clean. ARRRGHHHH to spring. It is totally being a slacker this year. Sooo pretty! I love the candy eggs on the top! Pinned! 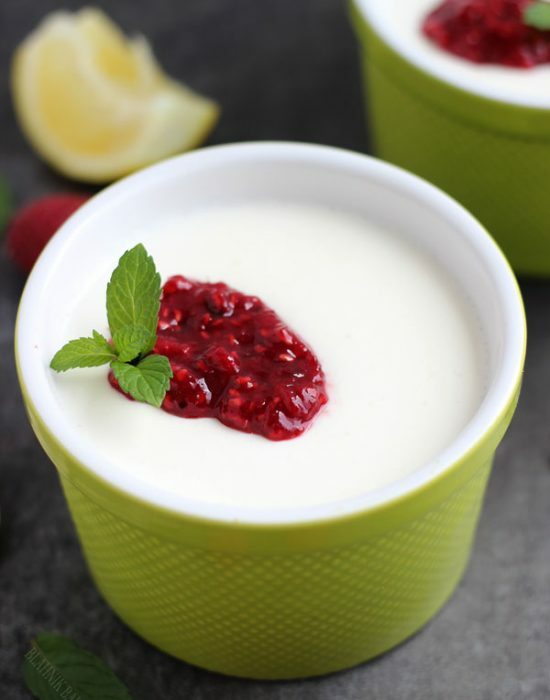 This pudding is definitely begging for me to try it – I can hear it practically calling my name through the screen :). Cannot wait to make this – I am blown away by the beauty of these pictures, btw. Definitely pinning this for later!! This pudding looks incredible Zainab! So rich and creamy and you KNOW I love chocolate and coconut together 🙂 You need to come out to California – we’re in the 70s and 80s right now. Good bye Spring, hello Summer 🙁 Pinned! 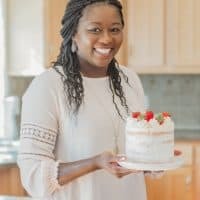 Hi Zainab, What a delicious recipe. I like the combination of chocolate and coconut. Hope the spring will come soon in your place. Spring is already there in France makes people feel better. Oh my — this pudding looks absolutely decadent! For years and years, I’ve been avoiding pudding because it was my go-to food back when I had braces. My mom would make me a huge bowl of pudding each week, and I would eat it for breakfast, lunch, or dinner whenever the braces were making my teeth hurt too much. After all that pudding, I thought I’d never want to eat it again. BUT — now that it’s been 10+ years and I stumble across your lovely recipe, I think I need to give it another try. Especially because I have a can of coconut milk in my cupboard and have been trying to decide what to do with it. 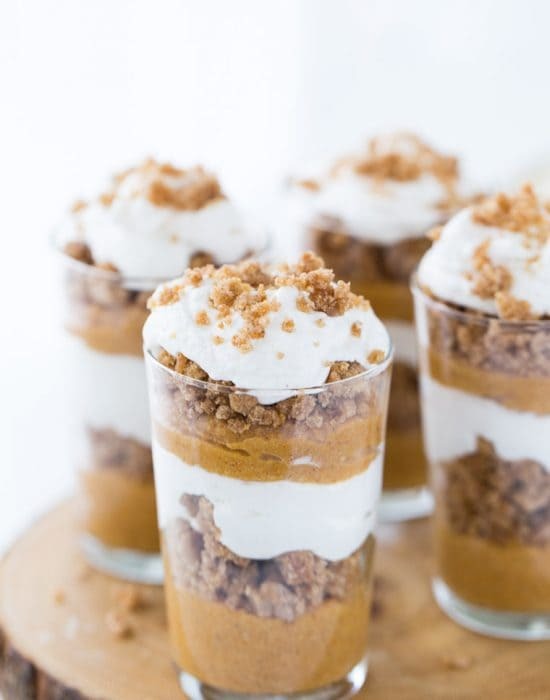 Yes, this pudding is definitely in my future! Thanks Jamie! I’m so sorry you had a bad pudding start. But I am sure this will change your mind. Have a great weekend!! I think I could really get into this dessert, Zainab! I love the flavor of coconut, but sometimes I have trouble with the texture of shredded coconut. I love how this is so creamy and smooth, but it’s got the double coconut whammy with the whipped coconut cream too. Pinning! Thanks!! I know you are not a fan of coconut usually (I still don’t get it lol!) but this creamy version with the milk is really good and different. 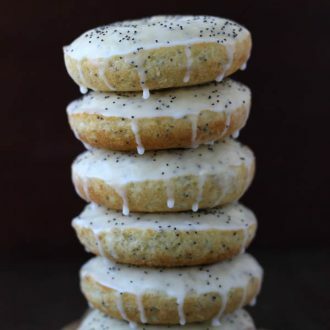 Visiting from the party at A Little Claireification — these look so delicious! Can’t go wrong with chocolate and coconut! Your pictures are always so gorgeous! Great job highlighting this pudding! I am pinning this and I never pin anything. I put my link into the SITS sharefest this morning and your link caught my eye but I didn’t have time to check it out until tonight. That pudding picture has been taunting me all day! I have never made homemade pudding, but that may have to change. Great photos and great recipe. Can’t wait to try it! Gorgeous puddin’, Z! Perfect any time of year. I’m with you…wish the warmer weather would finally get here. Ugh. Thanks for sharing! Just pinned from you. 🙂 Have a lovely Sunday! Thanks Stacy!! I hope it’s getting warmer for you this week! OMG. I can NOT wait to try this! Yummy! ugh i hear ya on the spring thing. what a dessert though! 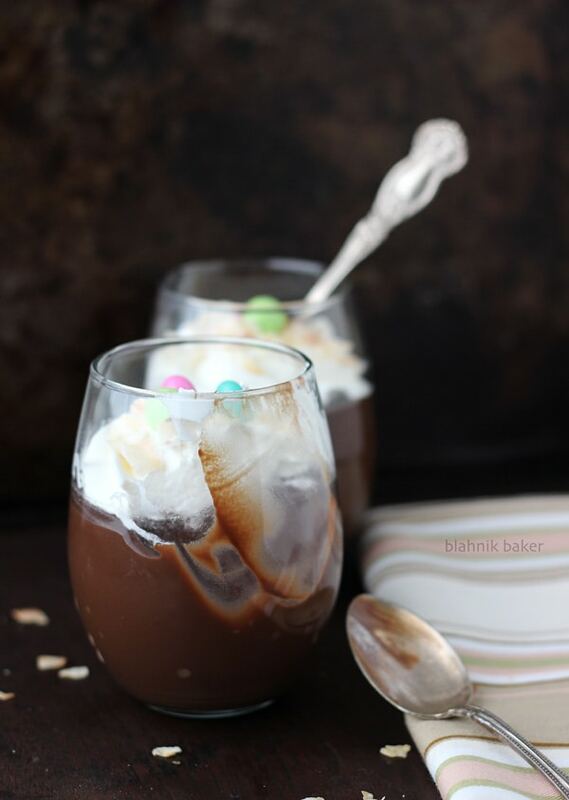 Oh my goodness….. that dark chocolate pudding looks so creamy and silky!! I could eat a whole bowl of that right now!!! Looks amazing, and beautifully served, too! It’s freaking April! Why is the weather so cray cray?! I feel for ya, girl. I wouldn’t have survived a winter like the one you’ve had. 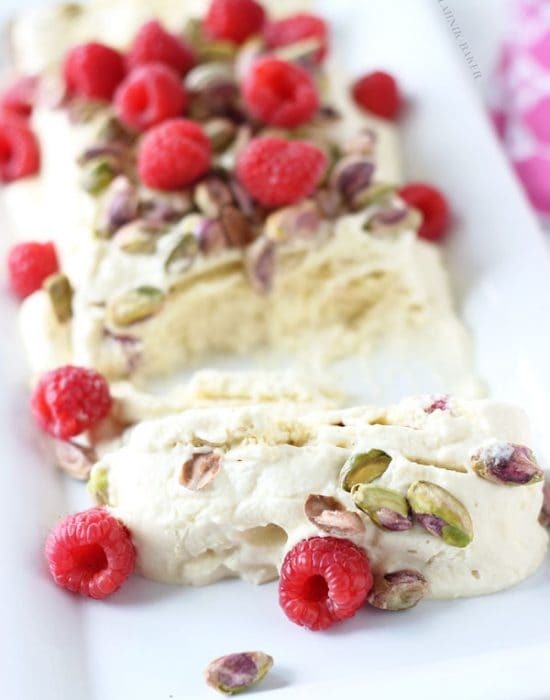 This pudding looks ridiculously creamy, luscious ‘n decadent. I love that you used coconut milk. Yum! Your photos are incredible too. I agree with Jocelyn – the moodiness is fantastic! Oh my! 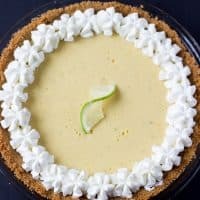 This looks and sounds sooooo yummy: I have no choice but to pin and try this recipe!!! PS this would be terrific at the party on my blog!! This looks delicious!! It’s not even 9am and I wish I was eating this right now for breakfast! Yum!